Scientists have discovered the first horned dinosaur. 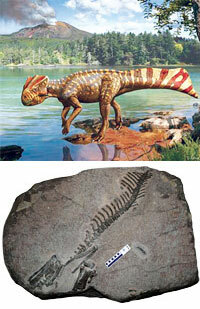 Fossils of Koreaceratops hwaseongensis were found from South Korea’s Hwaseong city. This is the first time fossils of dinosaur have been found in this region. It fills a missing 20-million-year gap in fossil record between the origin of these dinosaurs in Asia and their first appearance in North America. The dinosaur was five to six feet long and weighing between 27 kg and 45 kg. The animal was small compared to its geologically younger giant relatives like North America’s Triceratops. Koreaceratops had a parrot-like face with a beak at the front of its jaws, indicating it was a herbivore, a ceratopsian, first of its variety from the Korean peninsula. The creature had an unique fan-shaped tail formed by long neural spines, which suggests it may have been a good swimmer, and spent part of its time hunting for aquatic food. It lived about 103 million years ago during the late Cretaceous period. Researchers have found that major crop-killing mildews sneak into the plants in disguise. Researchers mapped the genomes of two mildews and found the parasite inside the fungi shed genes that trigger an immune attack in the host plants. Blumeria graminis, or powdery mildew, and Hyaloperonospora arabidopsidis, or downy mildew, begin with tiny parasites causing white spots on stem and leaves. These parasites within the genome known as transposons transform themselves, shedding certain genetic traits, so the plant becomes confused and does not attack them. The enzyme that makes fireflies glow can be used for better detection of blood clots. Methods like venography and ultrasound used to detect clots are time-taking and not accurate. The enzyme, luciferase, when combined with a special dye emits near-infrared light. These rays penetrate deeper into the body and give image of proteins involved in blood clotting. In lab, the new material successfully detected minute amounts of blood protein, called factor Xa, which are activated when blood clots are formed. Scientists have found the first carbon-rich planet. This raises hope of discovering a place where diamonds and graphite as big as rocks are strewn around. It increases the probability of rocky planets. Most planets known till date are gaseous. Located at a distance of 1,200 light years from the earth, the new planet, called WASP-12b, orbits a star slightly hotter than the sun, with one side always facing the star. The side that faces the star is 2,316°C—hot enough to melt steel. All terrestrial life depends on six elements: oxygen, hydrogen, carbon, nitrogen, sulphur and phosphorus. These are needed to build DNA, proteins and fats. They are also biological signatures of life that scientists look for on other planets. 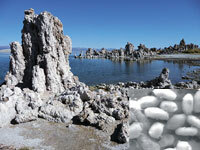 Scientists have now discovered a bacterium from California’s Mono Lake, GFAJ-1, that replaces phosphorus with arsenic in its molecular make-up. Phosphorus forms the backbone of strands of DNA and RNA, as well as of two molecules which are key to energy transfer in a cell. The bacterium even incorporates the toxic chemical into its DNA. The finding gives weight to the long-standing concept that life on other planets may have a radically different chemicalmakeup. The sky is more crowded than it appears. Astronomers have found that the number of red dwarf stars, the most common, is three times than thought. It implies the universe is triple the currently believed size and there are better chances of finding a new earth. They detected the dwarfs in eight new galaxies, 50 to 300 million light years away, and in the Milky Way. The study also questioned a key assumption that most galaxies have the same properties as the Milky Way. They found that about one-third of the galaxies in the universe are not spiral, but elliptical. Elliptical galaxies have more dwarfs. A drug originally developed to fight tuberculosis could be used to treat people with Autism Spectrum Disorders (ASD). Persons with ASD are either disinterested in social interactions or find them unpleasant. They often do not understand what other people are thinking or feeling and misinterpret social cues. Researchers used D-Cyloserine on mouse models and found the drug improved sociability in a certain strain of mouse that is known for displaying limited social behaviour. Plants have the ability to adjust to their environments. Scientists have found that plants growing near the Chernobyl disaster site in Ukraine, worst nuclear power plant accident, have developed ways to flourish in highly radioactive soils. Plants like soyabean and flax have adapted to the contaminated soil with certain changes in some of their proteins. The proteins altered were those involved in cell signalling, or chemical communication, which might help the plants shrug off radioactivity. Exposure to polluted air early in life can lead to accumulation of abdominal fat and insulin resistance, which often progresses into type 2 diabetes. Air pollution causes various health problems. This is the first study which shows that it makes one vulnerable to diabetes. For the study, researchers exposed mice to fine particulate air pollution commonly associated with automobile exhaust. When the mice reached adulthood, they had larger and more fat cells in their abdominal area and higher blood sugar levels than normal mice. They could not ascertain the reasons. Southwestern US could be hit by drought conditions lasting up to 60 years. Scientists analysed occurrences of drought and swings of temperature in the last 1,200 years and used them as basis for climate change models. Recorded information plus the examination of rings in the core of trees revealed that drought conditions were much more severe in earlier times. They say what was experienced then may happen again because of the current higher temperature. The study noted that during the 12th century, northern Mexico and western US experienced a dry spell that lasted for 60 years.